Of all the places in New York City during the 40’s, “paradise” could be found in the East Bronx. 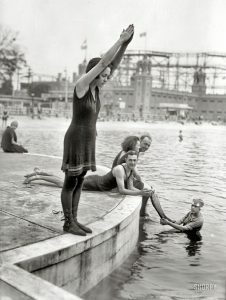 Adjoining the Bronx River, when it was clean and frisky, a magical park with a huge pool in the round, surrounded by beach sand. In a world where basketball was king, here was a lovely but rarely used soccer field. For whom? Probably the immigrant children a generation ago. A friend, with his visiting German-speaking cousins, organized a game. Poster boys for Hitler Youth; blond and tall. Gave a victory salute, “Heil Hitler,” paradise was cursed. Though kids, we understood but were silently stunned. Later we learned of a revenge stomping by the older boys. There was the joy of swimming in that cool, pristine river and the thrill of watching “crazy Phillip” dive from the overpass near West Farms Square. An adventure, trying to go upstream past the dilapidated ancient gas house to the densely forested Bronx Park. Overhead, the toxic Cross Bronx Expressway hovers. The shadow of the “great destroyer” Robert Moses. our paradise “Starlight” far away—dim, in an old man’s memory bank. Some interesting things do happen after 2am, like poop-infused eggplants.